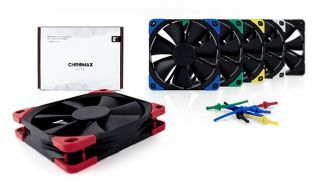 Austrian CPU cooler manufacturer Noctua has released its line of 'chromax' parts that allow you to color-customize your fans. Case modders, take notice. According to Hardware Heaven, the NA-SAV2 anti-vibration mounts and NA-SAVP1 anti-vibration pads come in red, blue, green, yellow, black, and white. The chromax edition of the anti-vibration mounts fit all types of Noctua fans, including redux models. However the pads fit all NF-F12, NF-S12A, and NF-A14 models, and are ideal for the black industrialPPC line. The NA-SAV2 kits include 20 anti-vibration mounts for five fans, while the NA-SAVP1 kits include 16 anti-vibration pads for 2 fans. The suggested retail price for each of the kits is €7 / $7.